Worlds of imagination and adventure await you! 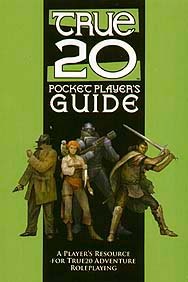 With the True20 Pocket Player's Guide you can embark on journeys of the imagination, with heroes and stories you and your friends create. This book has all the rules you need to play an exciting adventure roleplying game: from creating your heroes and defining their capabilities to handling action and conflict. True10 streamlines the adventure roleplaying experience: everything is resolved using the same core system and all you need is a single 20-sided die to play! There's no bookkeeping of points, whether hit points, power points, or experience points, and the game plays fast and furious thanks to innovations like the Toughness save damage system, based on the award-winning Mutants & Masterminds RPG. All this and more awaits you. If you want a fast, simple and fun game system that's still famliar to players of the world's most popular RPGs, if you want a vehicle for travelling to new worlds of adventure, if you want a guide to playing a fun new game, then True20 is for you!